Google is adding a wide range of features to its AI-powered Google Assistant that focus on improving the experience at home. First, family members will be able to respond to broadcasts. The broadcast feature lets people send a voice message to their Google Home speakers or video displays from their phone. Until now, broadcasts have been a one-way feature. Moving forward, people who receive broadcast messages via Google Home speakers/displays can reply. The reply is transcribed and sent to the original broadcaster as a notification. Next, Google Assistant is targeting in-home chefs. Smart display users will now see recommended recipes on an info card. The recommendations will be based on previous recipe searches. Google says recommendations will be updated regularly based on the season and time of day. Users will be able to save their favorites for easy referencing. Alarms just became more fun for kids. Google Assistant can now set up alarms based on popular animated characters that include signature music, jokes, and other messages. The Read Along feature is being improved with more sound effects and music from select books, and the Assistant itself can read any of 25 family-friendly stories upon command. Google Assistant now hooks into more smart TVs from the likes of Panasonic and LG. It can provide a Home View dashboard for controlling media and entertainment devices. Podcast lovers have new control over playback speed. Last, Google is bringing routines to the clock app for Android phones. 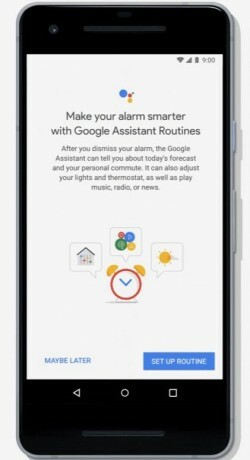 For example, after the user dismisses the alarm, Google Assistant can immediately begin a routine, such as reading the news, providing a weather or traffic report, or turning on pre-set lights. On the flip side, Assistant can turn on do not disturb mode on all devices with a single command. Google says these features will roll out slowly to Google Home speakers, smart displays, and Android phones over the coming weeks. Google today introduced an update to Google Assistant that brings new behaviors and features to the voice-activated helper. First, the Assistant is rolling out a feature meant for families called Pretty Please. Google today enabled the broadcast feature on Google Home devices in English in the U.S., U.K., Australia, and Canada. Now, people with Google Home devices in their house can broadcast announcements or statements from their phone-based Google Assistant to their Home device. Google today expanded the scale of its Google Express service with the addition of Target stores nationwide. Starting immediately, people who live in the 48 contiguous states can ask Google Assistant on the Google Home product to purchase items from Target. Instagram today made it possible for people to share their live broadcasts through the Stories tool for up to 24 hours. Once users conclude a live broadcast, they can tap a new "share" button to add a replay of the the live broadcast to their Stories. Google today announced a comprehensive update to the Google Assistant. Most of the changes are meant for developers, but everyone will benefit from Assistant's improved ability to interact with third-party applications.